Organocatalysis, that is the use of small organic molecules to catalyze organic transformations, has been included among the most successful concepts in asymmetric catalysis, and it has been used for the enantioselective construction of C–C, C–N, C–O, C–S, C–P and C–halide bonds. Since the seminal works in early 2000, the scientific community has been paying an ever-growing attention to the use of organocatalysts for the synthesis, with high yields and remarkable stereoselectivities, of optically active fine chemicals of interest for the pharmaceutical industry. A brief overview is here presented about the two main classes of organocatalysis which are respectively characterized by covalent and non-covalent activation of the substrate. More detailed information about non-covalent interactions for organocatalysis are given. Finally, some successful examples of heterogenisation of organocatalysts are also discussed, in the view of a potential industrial exploitation. We are thankful to the Reviewers for their useful considerations on this text, whose aim is not to be an all-embracing overview, rather an inspiring reading for a newcomer not familiar with organocatalysis. We have modified the main text and the abstract in order to stress the difference between this and other more comprehensive reviews. Indeed, this text is a brief overview with a particular focus on two main classes of modern organocatalysis. Nevertheless, in figure 4 and in the rest of the text, we have also highlighted that some other relevant organocatalytic activation modes have been investigated and exist in literature, such as NHC, SOMO and PTC. Here, for the sake of brevity and simplicity, we prefer to try to transfer to the reader the global sense of asymmetric organocatalysis, avoiding a tedious list of all-encompassing examples. Analogously, a description too deep into details about the mechanistic aspects for every example can make the text heavier to read, taking into account that the reader, if interested, can refer directly to the cited original papers. We have emended graphical mistakes, as mentioned by the Reviewers, and added, where missing, the absolute configuration of the products and the catalyst loading. We are thankful to the Reviewers for the positive opinion on the last chapter, where some successful examples of heterogenisation of organocatalysts and of potential industrial applications are discussed. This is a matter chemists have recently focused their attention on. We have thus presented here some selected examples that, at our best knowledge, according to the current state-of-the-art, have shown the most promising performances, in the path towards commercial large-scale applications. 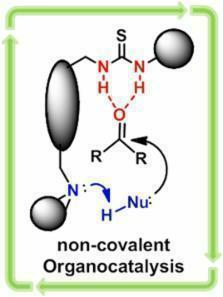 This brief review describes recent advances two main classes of substrate activation by the organocatalyst: covalent organocatalysis and non-covalent organocatalysis, and mainly focuses on some recent outcomesin the field of the non-covalent organocatalysis. This work meets the quality requirements for publication. However, one of important subfields in organocatalysis which is Lewis base-catalyzed reactions is unlisted in the present manuscript. Probably, this review should give a more specific description for the scope of this brief review. In addition, the authors should improve the presentation of their chemical drawing for Figures and Schemes (i.e. bond angles are frequently not respected, in many compounds “wedged bonds” and “hashed wedged bonds” should be used, …). In Figure 6, the “CO2Et” in compound 17 should be in one line. Many thanks for your remarks and for your interest in our work. The general aim of the present brief review is to provide the readers (especially, the ones who are familiar with traditional homogeneous or heterogeneous catalysis, but who do not currently use organocatalysis) with some hints about the potential of these catalytic systems for the synthesis of fine chemicals. Of course, for the sake of conciseness, this contribution cannot encompass all the possible applications and uses of organocatalysis. Such all-inclusive approach would indeed go beyond the general aim of the present text. So, we chose a selection of some interesting examples found in the current literature that are potentially promising for a further development, even if such choice may lead to the apparent underestimation of other relevant subfields (as the Lewis base-catalyzed reactions). A thorough revision of the manuscript is currently (March 31, 2015) in progress, where the problems and the typos (in figures and schemes too) evidenced so far by the Reviewers will be emended. A better remark about the global scope of the present short review will be also added. The revised text will be available soon. We are thankful to the Reviewer for his useful additional preamble on the importance of preparing compounds with a well-defined stereochemistry. In his articulate comment, he highlights that “the subject of this paper, has appeared as a valuable tool capable of demonstrating real usefulness” and this is indeed one of the reasons that prompted us to give an overview on organocatalysis. Surely, having in mind the broad audience of ScienceOpen that is made of chemists in various disciplines, and not of synthetic organic chemists, we tried not to write an all-embracing review, but rather an easily accessible overview focused on definitions, trends and developments of organocatalysis. So, the main goal for us is to recommend some examples of worthwhile reading literature on the topic to all chemists with a previous experience and expertise in catalysis, either homogeneous, heterogeneous or enzymatic (and therefore familiar with chemical and structural features), willing a deeper knowledge on organocatalysis and trying to evaluate whether organocatalysts may fit their problems or their applications. Now, thanks to Reviewer’s suggestions, we added some further relevant references in the text, including the 200-year-old work by Biot. With regard to the direct comparison between organocatalysis and other catalytic techniques, we are not necessarily convinced that organocatalysis is the only and unique tool to achieve excellent results in stereoselective synthesis. It is important for us, conversely, to show how a series of outstanding results have been obtained with these systems for some exemplar cases. Then, the skilled chemist will be able to select, on this basis, the most adequate techniques at his/her disposal within the broad panorama of catalytic tools for the synthesis of high added-value chemicals. Going into detail with the specific remarks by the Reviewer, about the apparently contradictory statement on enzymes on page 2, the words “but may also have some disadvantages” were actually missing present in the final draft. We apologize for this. The correct sentence now reads: “The use of enzymes has many attractive features in the context of the Green Chemistry approach, but may also have some disadvantages, such as limited stability of enzymes under certain organic reaction conditions and low efficiency when using wild-type strains”. We would like to thank the Reviewer for the hint about the removal of catalyst. This is actually a topic on which chemists have recently focused their attention, since the purification of the products from auxiliaries and catalysts is always advisable. A good point for organocatalysis, which has been cited in the introduction paragraph, is that in organocatalytic reactions there is no need of an extra step for the removal of the chiral auxiliary, as in traditional wasteful stoichiometric methods. Again in the introduction, it has been underlined that in organometallic homogeneous catalysis the removal of the catalyst (containing metals, which are often undesirable even in traces) has been efficiently solved by the heterogenisation of the catalyst. This is true for organocatalysis as well, and the point is debated in the last chapter, where the usefulness of the catalyst heterogenisation has been stressed and some exemplar works have been cited. We modify the text, in order to highlight more incisively these points We have emended typos and graphical mistakes, as mentioned by the Reviewer. With regard to formatting choices in the final PDF, such as the “annoying” need to turn the pages over in order to observe the figures, these features are not directly due to us and, of course, we will report such problems to the editorial office.